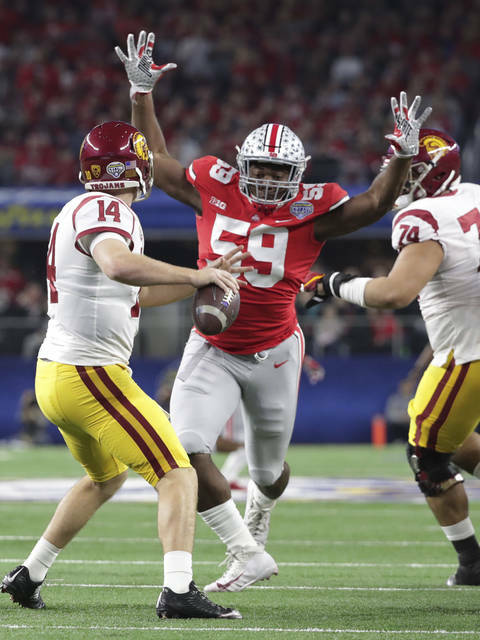 Ohio State defensive lineman Tyquan Lewis (59) closes in on Southern California quarterback Sam Darnold (14) during the first half of the Cotton Bowl NCAA college football game in Arlington, Texas. Damon Webb returned an interception for a touchdown after recovering a fumble to set up an early score and the No. 5 Buckeyes beat No. 8 Southern California 24-7 on Friday night in a matchup that traditionally has been in the Rose Bowl instead of deep in the heart of Texas. The Big Ten and Pac-12 champions would usually play New Year’s Day in Pasadena, but the Rose Bowl is a College Football Playoff semifinal game this season. Ohio State (12-2) instead quickly settled in at the NFL stadium where three years ago it won the first national championship in the four-team CFP format. The Buckeyes — with that bad loss at Iowa after an early setback to playoff team Oklahoma — were the first team left out this season. USC (11-3), the Rose Bowl champion last season, lost for only the third time in its last 23 games. The Trojans had four turnovers that led to 21 Ohio State points in what could have been third-year sophomore quarterback Sam Darnold’s final game. Buckeyes All-America junior cornerback Denzel Ward has already decided to go into the NFL draft and didn’t play after practicing with the team this week. With Ward on the sideline in his No. 12 jersey over street clothes, fellow defensive back Webb had a fumble recovery on the third play of the game. That led to J.T. Barrett’s 1-yard keeper for a score that put the Buckeyes ahead to stay. Webb’s 23-yard interception return for a TD put Ohio State up 17-0 less than a minute into the second quarter. It was the first pick-six this season for the Buckeyes, and the team-leading fifth interception for Webb. Ohio State was up 24-0 when Barrett ran 28 yards for another touchdown after the first of Darnold’s two fumbles when stripped while being sacked. Darnold was sacked eight times overall. Ohio State: Barrett, playing his final college game only about a two-hour drive from his hometown of Wichita Falls, Texas, broke Drew Brees’ Big Ten career record for total offense with 12,697 yards. Barrett played 50 games and was 38-6 as a starter. His 147 touchdowns (104 passing, 43 rushing) are also a Big Ten record, 41 more than Brees at Purdue. USC: Darnold, who became the first Trojans quarterback ever with more than 4,000 yards passing in a season, has until Jan. 15 to decide if he will head to the NFL or return to USC for another season. He didn’t indicate afterward what his decision will be. While he threw for 356 yards on 26-of-45 passing in the Cotton Bowl, his turnovers were costly. This was the eighth time Ohio State and USC met in a bowl game. The first seven were in the Rose Bowl. The Trojans had won seven straight in the matchup of powerhouse programs, including four regular-season matchups since their last meeting in Pasadena 33 years ago. Ohio State will play its 2018 opener at home against Oregon State on Sept. 1, the same day Southern Cal is home against UNLV. The Buckeyes and Trojans both return to the Lone Star State for games next Sept. 15. Ohio State will be back in AT&T Stadium to play TCU, and USC will be at Texas that day to take on the Longhorns.